MainBlogsFundamentally FreundDon't Tread on Us!! Few affronts to our national pride are as upsetting and as shameful as the situation on the Temple Mount in Jerusalem. The holiest site to the Jewish people is effectively run by the Muslim Wakf, which does as it pleases, never missing an opportunity to thumb its nose at Israel’s sovereignty over the area. Headed by a Palestinian-appointed Mufti, the Wakf has systematically destroyed priceless antiquities dating back to the Temple era with the aim of erasing any evidence of the Jewish presence that once flourished there. They impose severe restrictions on Jews wishing to visit the Mount, and also refuse to allow Jews to exercise their right to freedom of worship there. 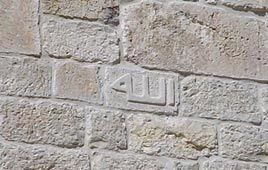 Now, adding insult to injury, Yediot Aharonot reports that Muslim construction workers have carved a half-meter tall inscription of the word “Allah” in Arabic on the Temple Mount’s Eastern Wall (see the photo to the left). But don’t expect Israel’s Government or police to do much, if anything, about this. Driven by fear, Israeli officials have essentially stood by and watched as the Wakf has repeatedly trampled on our national dignity and desecrated the place where Solomon’s Temple once stood. In light of such apathy towards our holiest of places –it should come as no surprise that our Government now wishes to turn over territory to our foes and throw innocent people out of their homes. After all, those who do not care about our sacred roots in this soil will hardly see anything wrong with uprooting that which has been planted. So, as long as this country allows its honor to be sullied in the heart of Jerusalem, with nary a peep of protest, our national humiliation is almost certain to continue to worsen.